Personal archiving of digital files is certainly going to grow as a major theme of the decades to come. As computer became a dominant, multi-task production tool, most of the documents we produce are today originally born in digital format (mail, photos, music, texts, etc.). Preserving these documents and make them accessible and readable in – let’s say - fifty years, is a major challenge that is now beginning to raise attention. 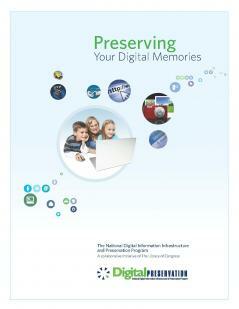 Recently, the Library of Congress released 6 online tutorial guides to digital preservation of personal photographs, audio and video files, electronic mails, digital records and websites, also available as an all-in-one PDF brochure. The private sector is also moving forward, as for instance the French based firms Myarchivbox or Forever, which offers web-based personal archiving services, the latter claiming to have already 150'000 clients.